You're hot property with real estate email marketing. 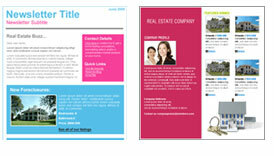 Establish yourself as the neighborhood expert with professionally designed newsletters. Showcase listings to thousands of inboxes in one click. Seed future business by educating your clients on real estate trends, news and market conditions. Outdo the competition with an email video tour of your current properties. Email Marketing is faster, cheaper and more effective than traditional mail. Our Drag and Drop Email Editor lets you create professional, content-rich messages in just a few minutes. Templates make it easy! Online Surveys put you in touch with what the market wants. Easily craft a great looking questionnaire and find out about your own curb appeal. Contact List Management quickly grows your pool of potential buyers. Sign up forms can be quickly integrated if you have a website or manually created or added from an office program if you don't. Benchmark Email creates your mailing list to significantly expand your leads, enhance your book of business, client listings and increase monthly sales closings ratios. Watch your sales rapport with potential clients soar, as you become the agency in the know regarding local events, community news, regional happenings and more.